You are currently browsing the In-Game Chat archives for the day Wednesday, October 23rd, 2013. Plenty of you are likely familiar with the regard in which I hold certain games and developers. There’s Criterion with the Burnout series and, of course, Naughty Dog and Uncharted. There’s a few others in there, but not many. The list grows very slowly if at all. However, the first studio and games that I ever fell in love with started on the PC and they started with adventure/puzzle games. I vividly remember playing The 7th Guest on my father’s 486DX40…I think. I don’t even know if that’s how you write it out anymore and no clue on ANYTHING about the specs it had, but Dad said it was good and it ran the game, so I was happy. While Trilobyte made me take notice of what kind of a world I could find on a PC and the puzzles waiting for me, it was another company that would fuel the obsession and forever remain my standard for adventure/puzzle gaming. 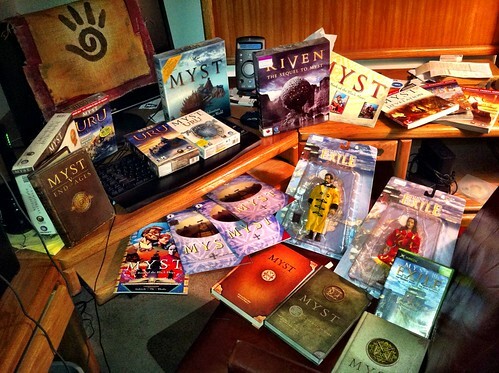 I’m not exactly sure what first drew me to pick up Myst from Cyan Worlds. I wasn’t following gaming news. About the closest thing I had was Nintendo Power at the time. It had to have been the box that made me buy it….or ask for it. Again, the details of how I came to own the game are fuzzy. I can only think that I walked into Electronics Boutique in the mall with my mother or father and looked at the PC section, noticed the box, the little banner on it claiming “WINNER OF 12 MAJOR AWARDS including 1994 GOLD MEDAL & 1994 WORLD-CLASS AWARD” and then either asked my Dad if his computer could play it or remembered what he’d told me enough to know it would and bought it. The bug had bitten me and I forever tried to reach back to that first feeling of visiting Myst island. Although, it only actually seemed to work when I played a Myst game. A few titles here and there came close. Syberia was one of those games, but as I played it, the game became its own thing and not something I ended up comparing to what Myst was for me. Myst has stayed with me since I played the very first game nearly 20 years ago. And I had long since given up on seeing anything new in the universe. Myst V: End Of Ages was the finale, and I had my doubts early on in the release of that game that we wouldn’t see a Myst VI or some kind of side venture, but the more I read about End Of Ages, the more I began to accept that the adventure was over. Then, just a week ago (the day before my birthday, in fact), a project on Kickstarter sprung up from Cyan Worlds called Obduction. The first thing I did was look at the backer rewards for the boxed copy of the game (it’s at the $75 level). Done. Backed. Now, where’s the level that gets my name in the credits? Could they possibly have a level that gets me to provide input for the development of the game or maybe a visit to the studio? They have all of those and more and while some of the levels are out of my reach, I’m still getting a boxed copy of their game whenever it’s released. That’s, of course, assuming their project gets funded, but I really have no doubt in my mind it won’t pass its goal and become a reality. It’s been a long time since I’ve had a game from Cyan to look forward to, and it doesn’t really matter that it isn’t part of the Myst….mythos. It’s a new beginning from them. And maybe it doesn’t take a Myst game to bring me back to that first feeling of being on Myst island, maybe all it takes is Cyan to keep doing what they do best. That’s a project I’ll support every time they offer it. As was said to me 20 years ago in Myst by one of the founders of Cyan…perhaps the ending has not yet been written.